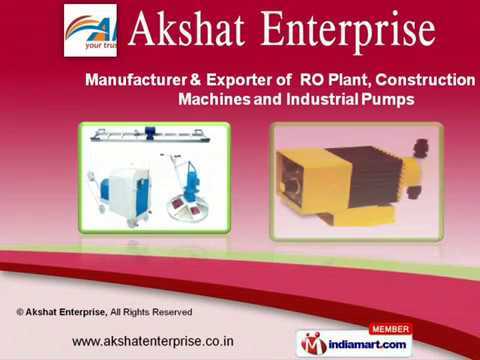 Propounded in 2009, we, Akshat Enterprise are ardent entity involved in manufacturing, exporting, supplying and trading wide assemblage of Water Filters and Water treatment Systems. Dosing Pump, Submersible Pump and Construction Machinery are some of major products among our extensive range of products. Our great mastery in technical aspects while offering these products have instituted as precursor among our competitors. High durability, dimensional accuracy, superior finishing and precise design of our products are very much applauded in the market. We deem to extend our clientele base globally by setting customers%u2019 satisfaction as cardinal goal of our firm.